For everything from the nearest golf-courses, to zip-lining and skiing, right down to the detail of how to find our private parking lot, the options above should be of help. Carlisle is the seat of Cumberland County, and since its founding in 1751 it has been the center of both business and leisure opportunities revolving around its location as the Crossroads of Pennsylvania in the Cumberland Valley through the Appalachians. The mountains to North and South of Carlisle provide the backdrop to many activities, the links on this page will take you to a wide variety of websites, with things to do from fishing to walking to hiking to skiing. Choose your activity at your own speed in and around Carlisle. The limestone streams around Carlisle are world-famous for the quality of the fly-fishing experience. In fact, the Yellow Breeches and the Letort Spring Run are listed as two of the top 50 trout streams in the world. Along with the Conodoguinet Creek they form part of the tributary system of the Susquehanna River (or “Sasquesahanough” as Captain John Smith wrote it in the year 1612) which in turn enters the Chesapeake Bay at Havre de Grace, MD. Central Pennsylvania is rightly famous for its fly-fishing. the Pennsylvania Fish & Hunt Commission work hard to ensure that streams such as the Yellow Breeches and Letort Spring Run are well stocked with fine trout of different varieties. A visit to Huntsdale State Fish Hatchery is fascinating and shows the process of maintaining Pennsylvania’s high quality of fishing streams. Just a 17-minute drive from the Carlisle House Bed and Breakfast, the Huntsdale State Fish Hatchery is situated on approximately 80 developed acres (167 total acres) of land owned by the Commonwealth of Pennsylvania and managed by the Fish and Boat Commission, in the Village of Huntsdale in Cumberland County, Penn Township. 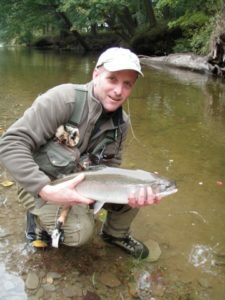 Personalized fly-fishing guiding and instruction is available at Tom’s Fly-Fishing Service, where Tom Brtalik is eager to take you to his favorite spots on Clark’s Creek, Yellow Breeches Creek, Big Spring Creek, Letort Spring Run, and many others. He can show you the techniques for Dry Fly, Nymph, Wet Fly, Streamer, Trout and Bass fly-fishing. Amateur or expert, every angler dreams of landing the big one, but that’s only part of the appeal of fly fishing. Because even when hours pass without a bite, nothing beats the rugged beauty of the surroundings. For both armchair travelers and avid outdoorsmen who may have already started a checklist of their own, Fifty Places to Fly Fish Before You Die by author Chris Santella maps out the meccas of the fly-fishing world. Included is the Letort Spring Run, just 1 mile from the Carlisle House Bed and Breakfast. Our picture shows renowned Pennsylvania expert trout-fisherman Ed Shenk. Carlisle has some extremely good, challenging golf courses. From the links course at Mayapple to the scenic course at Eagle’s Crossing alongside the Conodoguinet Creek, there are opportunities for golfers of every level to go out and ruin a perfectly good walk in the countryside! Carlisle provides many opportunities for touring by foot, bicycle, and car. For more information please contact us directly. If you want to explore Pennsylvania’s great outdoors, you’ve come to the right place! The Carlisle House Bed and Breakfast is within easy distance of King’s Gap, Colonel Denning, Big Spring, Pine Grove Furnace, and many other State Parks in the Dutch Country Roads region of South-Central Pennsylvania. The Cumberland Valley provides the mid-point to the world-famous Appalachian Trail, which stretches from Georgia to Maine. From here you can walk the trail to your heart’s content! If you are hiking the trail, we would be happy to pick you up and drop you off at the AT Field Office in Boiling Springs. The Susquehanna river has played an important role throughout the history of the United States. Before European conquest, the Susquehannock, an Iroquoian tribe, lived along the river and gave the Susquehanna its name. There are few things more pleasant on a warm summer’s day than floating down the river through beautiful Pennsylvania countryside. There are many attractions around Carlisle, some permanently here, some which vary with the seasons, either way you will find many things to do. We have listed the attractions which present opportunities for enjoyment year-round, but please take advantage of our Twitter, Blog, and Facebook presences to keep in touch with the happenings here in Carlisle, the Crossroads of Pennsylvania. From Boutiques to Beading, and Ballet shoes to Brogues, Carlisle has enough shops to keep everyone happy! And of course there are refreshments ranging from premium coffees to the 50’s Malt Shop to keep you going as you empty those shelves! From Polish pottery and display cases made from antique window sills and frames at Firehouse Antiques on West Street in Carlisle, to more than 100 vendors at Bedford Street Antiques (the old Carlisle Garment Company), to shop owners that can tell and show you some of the history of the Carlisle area, each antique shop has its own unique qualities that can turn your browsing experience into a “What’s around that corner?” adventure! The Carlisle Theatre, originally called The Comerford, opened its doors in May of 1939. During its early years, the Theatre offered daily continuous shows from 2:30 until 11:30 P.M. The matinee price for adults was 25 cents and the evening price 40 cents. With the advent of cineplexes, the Theatre entered a state of decline in the 1970’s, eventually closing in 1986. In 1993 a huge revival effort resurrected the theater as the Carlisle Regional Performing Arts Center and features live stage performances, indie movies, concerts and other performing arts. The Cumberland County Historical Society, founded in 1874, is dedicated to collecting, preserving and interpreting the rich history of Cumberland County. The Society maintains a library, archives, museum and lecture hall on North Pitt Street in downtown Carlisle and the Two Mile House in South Middleton Township. The CCHS has over 37,000 visitors annually (many of whom are interested in Pennsylvania genealogy research), over 1,500 members and 220 volunteers. The award-winning museum includes galleries of furniture, silver, tools, redware, pottery, ironware, painted plank-bottom chairs, tall-case clocks. samplers, coverlets, and paintings produced by local artisans. Particularly noteworthy are the Schimmel and Mountz woodcarvings and the materials from the Carlisle Indian Industrial School. The museum is free to the public. In 2002, Historic Carlisle Inc. and the Borough of Carlisle partnered to initiate the Carlisle Wayside Marker Project using interpretive signage to honor and preserve Carlisle’s rich historical past for the enjoyment and education of Carlisle’s residents and visitors alike. The Wayside Markers tell the story of Carlisle’s people, buildings and historic sites and events, and provide a gentle stroll through the beautiful Downtown Historic District. The U.S. Army Heritage and Education Center (USAHEC) is the United States Army’s preeminent museum and research complex, dedicated to educating and preserving the legacy of the men and women who have served their nation as soldiers. The ASHEC mission is to educate a broad audience on the heritage of the Army by acquiring, preserving and making available historical records, materials and artifacts. The USAHEC Vision is to become the premier center for US Army heritage focused on research, education and interpretation. Carlisle Events produces eight specialty shows, plus the Spring and Fall events which also serve as the basis for the Spring and Fall Collector Car Auctions. The specialty shows include Carlisle Performance & Style, Carlisle Import-Kit/Replicar, Carlisle All-Ford Nationals, Carlisle All-GM Nationals, Carlisle All-Chrysler Nationals, Carlisle Summer Bike Fest, Carlisle All-Truck Nationals, and Corvettes at Carlisle. With more than 1500 show cars and more than 9,000 flea market spaces, the AACA Eastern Regional Fall Meet in Hershey is the place to be if you love cars! And of course, the Carlisle House Bed and Breakfast is the place to stay if you love comfort, great breakfasts and terrific restaurants to recover from the show days! Just 40 minutes from Hershey Park. During each year there are a myriad of events bringing visitors to Carlisle from all over the world. These are a few of the on-line event calendars which will give you yet another reason to come and stay in Carlisle’s Premier lodging at the Carlisle House Bed and Breakfast! History is happening around you! As you walk through Historic Carlisle, check the wayside markers and discover the historic footprints of those who traveled this way in bygone days. During each year, Historic Carlisle arranges events ranging from the installation and dedication of new Historic Markers, through the Annual Tavern Dinner, the Carlisle Summerfair Historic Walking Tours, and major events such as the presentation of “Jefferson and Adams”, a performance by the noted Williamsburg troupe which was held in the Carlisle Theatre, and which was provided at no charge to a wildly enthusiastic audience! A Forward-Looking Historical Society? Absolutely! Who else would have the website name “historicalsociety.com”? This is one place in Carlisle which should be on the list for all your visits. Click on the picture to go to their website where you can find details of all the current and upcoming events. For almost four decades, Carlisle Events has been a staple in the automotive community. Our passion is legendary to those who have made Carlisle, Pennsylvania their “Automotive Hometown.” We host or are a part of 17 seasonal events, 11 of which are held at the Carlisle PA Fairgrounds, two at the Auburn Auction Park in Auburn, Indiana, two at Festival Park in Zephyrhills, Florida and a singular event at the Bloomsburg Fairgrounds in Bloomsburg, Pennsylvania. These events draw enthusiasts from all over the world. Visit Carlisle Events to see what is happening in the Valley! Every season is event season in the Cumberland Valley! Grab your family and friends and head out to explore the unique collection of events in The Valley. We have just the event for any passion. Savor delicious delicacies at our food and wine walks and festivals, discover a dazzling performance at our downtown theaters or get a blast from the past at our huge living history weekends. And don’t forget to call in at the Visitor Spa Sparkle and Shops for 1. Located in the heart of Carlisle, the historic Carlisle Theatre has been referred to as “the gem of downtown” since 1939. The Carlisle Regional Performing Arts Center presents musical concerts, performers, films, live theatrical productions, and programming for children and families. The Theatre is also available for corporate events and meetings, community events, weddings, and much, much more! The Downtown Carlisle Association is dedicated to showing off the many great features of Downtown Historic Carlisle! With First Friday events through the summer months, and the great automotive experiences of the Ford and Corvette Parades, you will never be short of an exciting visit to Carlisle, PA!